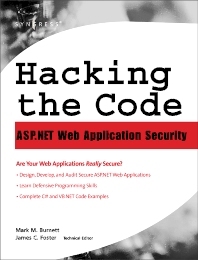 Hacking the Code has over 400 pages of dedicated exploit, vulnerability, and tool code with corresponding instruction. Unlike other security and programming books that dedicate hundreds of pages to architecture and theory based flaws and exploits, Hacking the Code dives right into deep code analysis. Previously undisclosed security research in combination with superior programming techniques from Foundstone and other respected organizations is included in both the Local and Remote Code sections of the book. The book is accompanied with a FREE COMPANION CD containing both commented and uncommented versions of the source code examples presented throughout the book. In addition to the book source code, the CD also contains a copy of the author-developed Hacker Code Library v1.0. The Hacker Code Library includes multiple attack classes and functions that can be utilized to quickly create security programs and scripts. These classes and functions simplify exploit and vulnerability tool development to an extent never before possible with publicly available software. Security professionals in technical programming and scripting market. Educational institutions teaching security.